Babblings of a Mommy: I Love You Stinky Face. I Love You Stinky Face. I thought I might share with you one of my daughter's FAVORITE books. 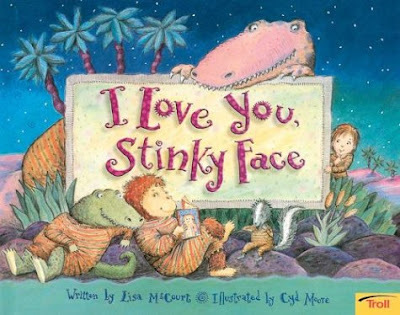 It's a fun book that describes how a mother's love would not change even if your child were a big scary ape, a smelly skunk, a swamp creature, a bug eating alien and more! The book is silly and my daughter gets a real kick out of it every time. Have you read this book before? Is it one of your favorites too?? Let me know! I love this book and my son can't get enough of it. This is such a cute book! I picked it up at TJ Maxx and I love it. :) Looking forward to the day my son will sit still long enough for me to actually read it to him (he's only 16 months).